Melt the butter in a small saucepan over a low heat. Place the digestives in a plastic freezer bag and bash with a rolling pin until they becomes a fine crumb, with no big lumps, then add to the melted butter and stir really well to ensure all of the crumb has soaked up the butter. Turn out in to a 8″ springform cake tin and using the back of a spoon press the mix firmly in to the base of the tin, spreading it out evenly to ensure the surface is nice and smooth. Cover with some cling film and put in the fridge for around 30 minutes to set. Now to make the topping. Before melting the white chocolate take one of the bars and grate a little (say a tablespoon or so) and leave to one side. Break the rest of the chocolate up in to chunks and place in a heatproof bowl over a pan of gently simmering hot water (making sure the bowl is not touching the water) and leave it to melt. Place the cream cheese in to a stand mixer or bowl and whisk lightly to soften, then add in the cream and whisk again on a higher speed until the mixture becomes nice and thick – this should only take a couple of minutes. Then with the whisk running slowly pour in the melted chocolate in a steady stream, mixing all the time to ensure it is evenly blended. 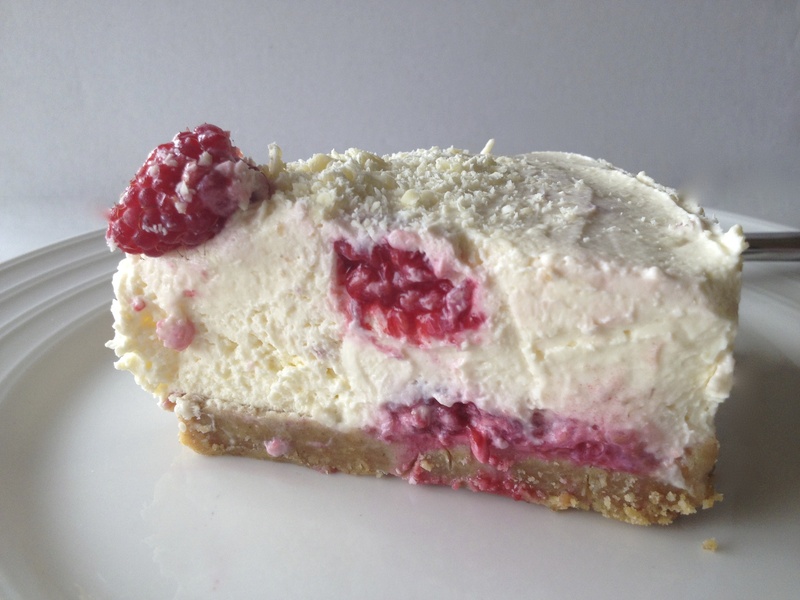 The consistency of your topping should be firm enough that it won’t run anywhere when you remove the cheesecake from it’s mould. Now add in the raspberries, reserving a few for the top, and stir gently with a spatula or large spoon, just enough to distribute the raspberries evenly but without turning the entire mixture pink. Remove the cake tin with the digestive base from the fridge and dollop the topping on, using the spatula or spoon to make sure it is spread evenly. 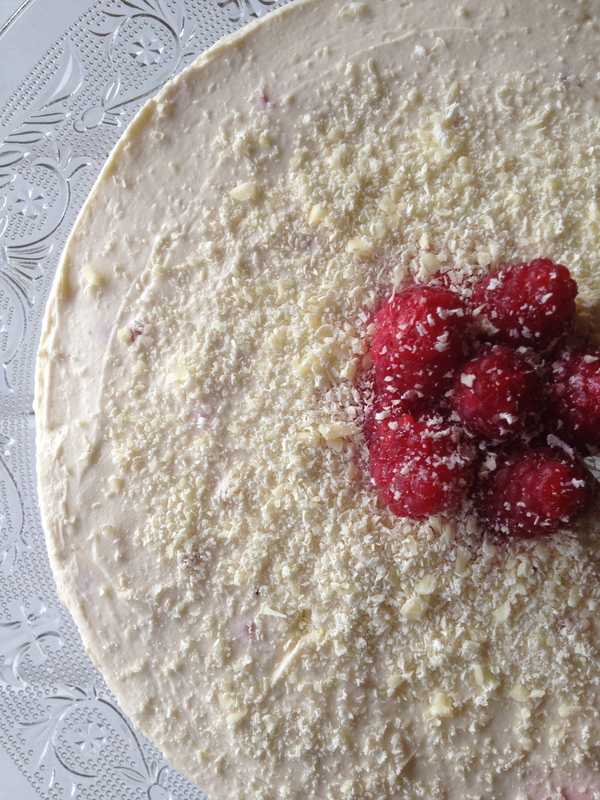 Smooth the top of the cheesecake gently and then place your reserved raspberries on top and sprinkle with the grated chocolate and the cover with cling film and leave in the fridge to set for a few hours. 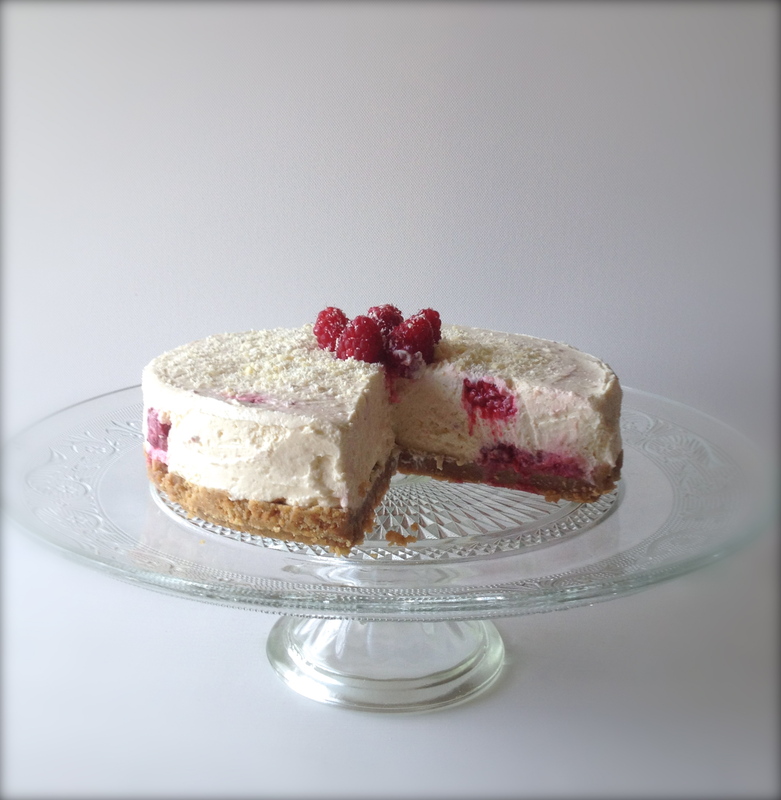 When you are ready to serve remove the cheesecake from the tin by sliding a flat bladed knife carefully under the digestive base to make sure it comes away from the base of the cake tin. We’ve recently launched the site http://www.alldishes.co.uk, where our users can search among thousands of recipes from British and Irish food sites and blogs. In our site we have created the Top Food Blogs section, where you can also add your blog. And don’t worry because everything on Alldishes.co.uk is free! Our concept is already live in Sweden, Denmark, Norway, Germany and Spain. Do you want to be a member of this big family?